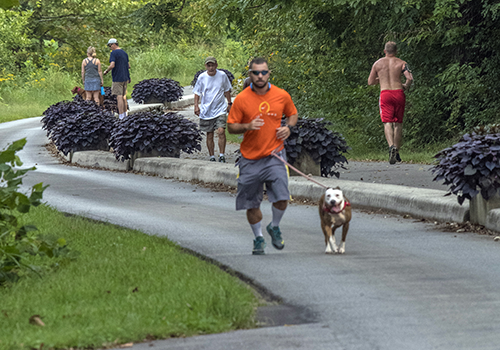 Montgomery County has invited five counties, five towns, four cities, two state universities, two trail organizations, two regional commissions and one metropolitan planning organization to join in a plan to create the Valley to Valley Trail. The proposed biking and walking trail would stretch from Botetourt County to Galax. Commission Vice Chair April DeMotts says everyone contacted about the idea has expressed interest. The county is organizing the group’s first meeting. “I think the first thing the Valley to Valley Trail Committee will need to do is get out some maps, map out what we have, and then find out where are the good connection points, some of the low-hanging fruit,” DeMotts says. Roanoke Valley Greenway Coordinator Liz Belcher thinks that may be a good first step. “You’ve got to have a clue where you’re going to go, because the hardest part is getting right of way,” she says. Trails can take time. The idea of creating trails in the Roanoke Valley dates back to Roanoke’s 1907 comprehensive plan. The first Roanoke Valley Greenway segment opened 90 years later. Now the Greenway has more than 400 miles of trails, including the state and federal trails the Greenway connects with, more than 100 miles of on-road connectors for bikes and more than 90 miles of paddling trails on the Roanoke and James rivers. At the other end of the proposed Valley to Valley Trail, New River State Park stretches for 57 miles, from Pulaski to Galax. Last year, that trail created $29.2 million of economic impact and the equivalent of 426 full-time jobs, according to a Virginia Tech study. Building trails can cost up to $1 million per mile, Belcher says, particularly if they’re built with federal money. Environmental studies and compliance issues account for a lot of that sum. Each river crossing can add another $900,000 to $1 million. And there are bound to be right-of-way issues. Even the New River Trail, built on a former railroad bed, had one landowner who stubbornly opposed it. “For 17 years, there was a hole in the middle of that trail and a fence, and you weren’t allowed to go through,” Belcher says.